North Korea’s foreign minister Ri Yong Ho had a rare press conference outside the United Nations in New York. And it’s not great. The diplomat declared that the US has declared war on North Korea. And he stressed that he hopes the world remembers in the future that it was the US who declared war first. “As you already know, for the last few days, the United Nations sincerely wished that the war of words between the DPRK and the United States did not turn into real actions,” he began, according to his translator. President Trump declared in a speech at the UN last week that the US stands ready to “totally destroy” the country if necessary, in response to North Korea’s persistent nuclear weapons tests and overt threats to US territory Guam. His tweets about leader Kim Jong-un, who he calls “Rocket Man,” have also worsened tensions between the US and North Korea. Established in 1945 under the Charter of the United Nations, the General Assembly occupies a central position as the chief deliberative, policymaking and representative organ of the United Nations. Comprising all 193 Members of the United Nations, it provides a unique forum for multilateral discussion of the full spectrum of international issues covered by the Charter. It also plays a significant role in the process of standard-setting and the codification of international law. The 72nd Regular Session of the UN General Assembly (UNGA 72) is now on at Headquarters. 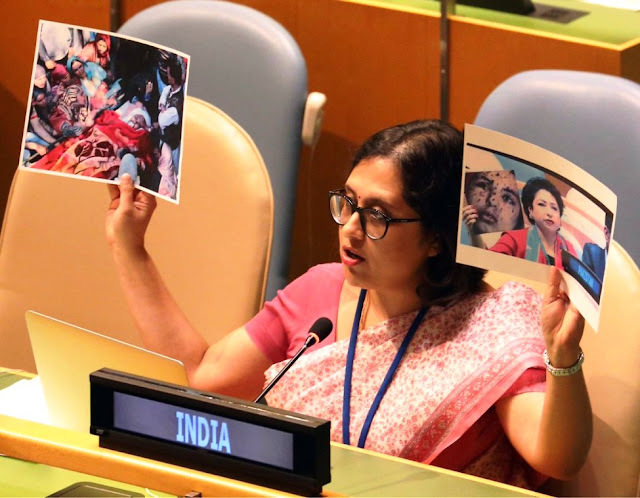 India went one-up with another photograph (a real one at that) to show the United Nations General Assembly on Monday -- that of Ummer Fayaz, the young army officer who had been dragged out of a wedding party and gunned down by terrorists in Kashmir in May this year. Paulomi Tripathi, the diplomat who was representing India, said it was the reality which Pakistan was trying to "obfuscate" by pushing "fake" photographs of Gaza as images from Kashmir. The photo in question was one brandished on Saturday by Maleeha Lodhi, Pakistan's permanent representative to UN. Ms Lodhi claimed the girl, whose face bore multiple bruises, was a victim of pellet guns in Kashmir and cited it as proof of what she called "Indian brutality". But the photo turned out to be of Rawya Abu Joma, a resident of Palestine, which was clicked by award winning photographer Heidi Levine in 2014. The girl, who was 17 years old at the time, had been injured in an Israeli airstrike. Maleeha Lodhi, Pakistan's permanent representative showed a fake photo and has been criticized widely by Global media. This, however, wasn't Lodhi's first brush with controversy. According to The Times of India, in February, Lodhi had deleted a congratulatory tweet about Oscar winner Muslim actor Mahershala Ali after being criticised for promoting an Ahmadi, considered to be non-Muslims in Pakistan. The 43-year-old actor had won the Oscar for his portrayal of a drug dealer in coming-of-age drama "Moonlight", becoming the first Muslim actor ever to win the prestigious award. Responding to this naked lie Ms Tripathi said - "The Permanent Representative of Pakistan misled this assembly by displaying this picture to spread falsehoods about India. A fake picture to push a completely false narrative." Paulomi Tripathi, secretary with India's permanent mission to the UN, held up together 2 photographs - one showing the army officer and the other of Pakistan's permanent representative to UN Maleeha Lodhi brandishing the picture of a Palestinian woman whom she had described as a Kashmiri - and declared, "True face of Pakistan is not hidden from anyone''. The army officer shown in the picture was Lieutenant Umar Faiyaz who was abducted and killed by terrorists in J&K's Shopian district. A 2007 batch IFS officer, Tripathi, who took on Pakistan's most experienced diplomat at the UN, is the junior-most Indian diplomat at India's permanent mission to the UN in New York which is headed by Syed Akbaruddin. Pakistan seems to have refused to accept the mistake. According to India Today, when Pakistan defence expert Qamar Cheema was questioned about the fraudulent incident, he said that even Israelis haven't been as brutal as Indians have been to Kashmiris. Earlier on Saturday, External Affairs Minister Sushma Swaraj had ripped apart Pakistan during her address at the UN General Assembly, emphasising how the neighbouring country had become the breeding ground of terror. In signs that her speech had ruffled feathers in Pakistan's "all weather friend", state-run Chinese media termed it as "bigotry". Terming as "arrogant" External Affairs Minister Sushma Swaraj's scathing attack on Islamabad at the UN for being the 'pre-eminent factory for terror', a state- run Chinese daily today in a grudging admission said "there is indeed terrorism in Pakistan". Their picture eventually portrayed their nefarious designs and evil mind.